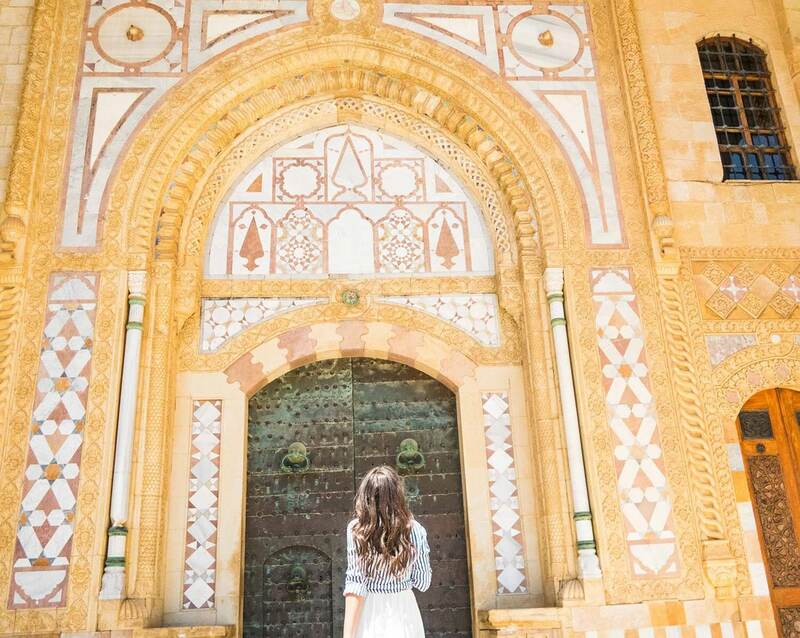 A Lebanon trip isn’t complete without a visit to the Beit El Dine palace. Built in the 19th century, it’s absolutely an architecture masterpiece. Whether you’re a history buff or a photography aficionado, it will take your breath away! 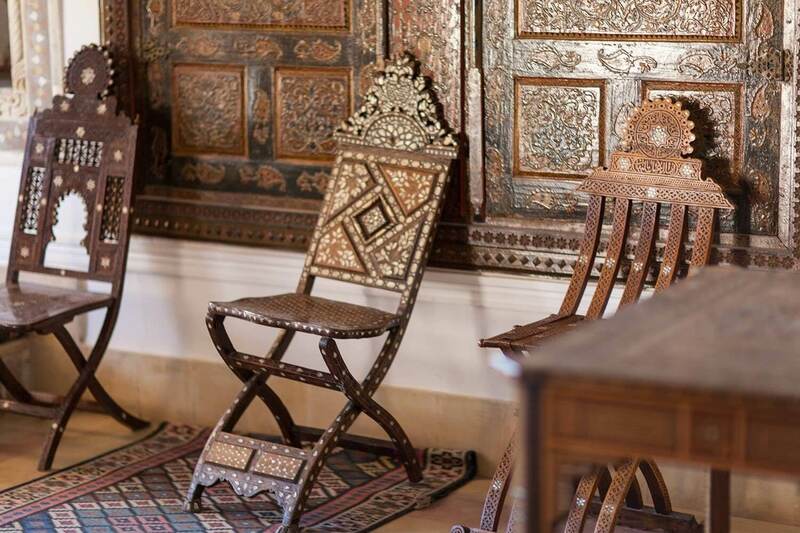 Converted to a museum, the public can now enjoy the beauty of the Beit El Dine palace. Although it’s the Lebanese president’s summer residence, its doors stay open all year long. Some parts close to the public when the president is present. It’s just another reason why spring, in my opinion, is the best time to visit Lebanon. No matter how big you are, the Beit El Dine palace will make you feel very, very small. 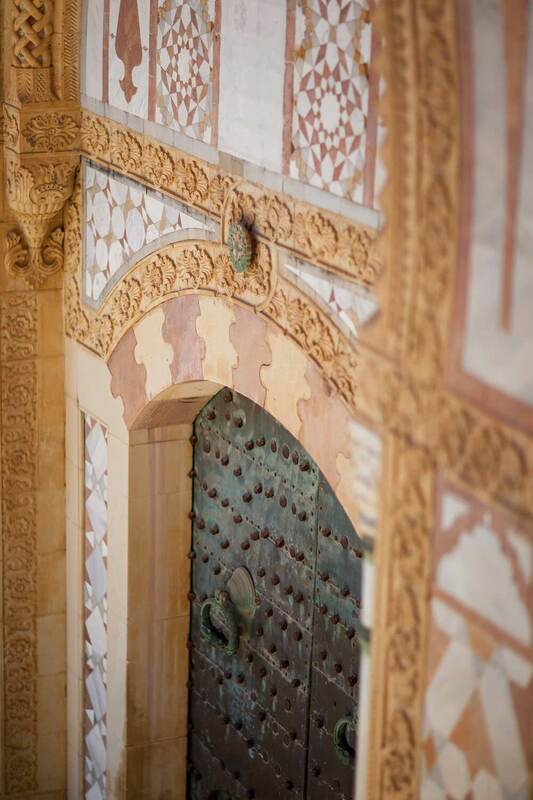 Huge courtyards and mighty entrances with glorious doors welcome you to the palace. You’ll get lost in the labyrinth of rooms that transport you from one space to another. Intricate details throughout show an unbelievable dedication to the art of architecture. Don’t keep your eyes low, up is where the real magic lies. The ceilings, covered in complex wood panels are a magnificent work of art. 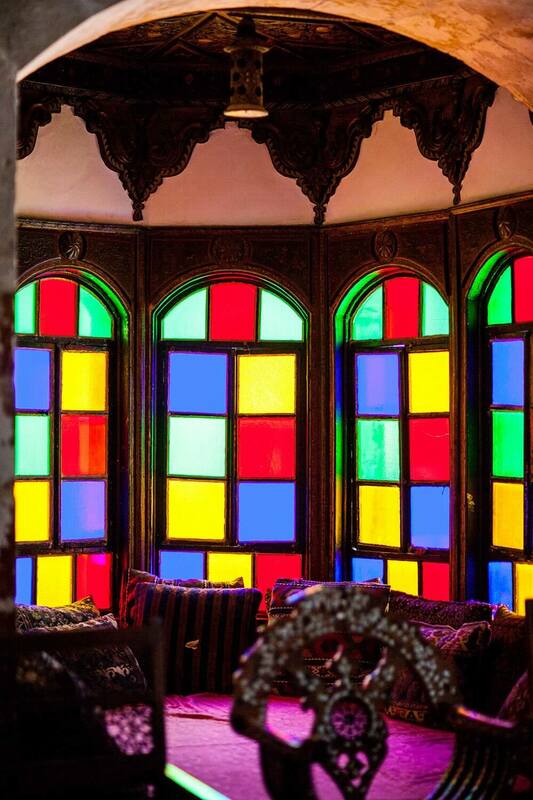 The color stained glass windows in the Hareem’s (women) quarter illuminate the rooms with the most beautiful rainbow of colors. 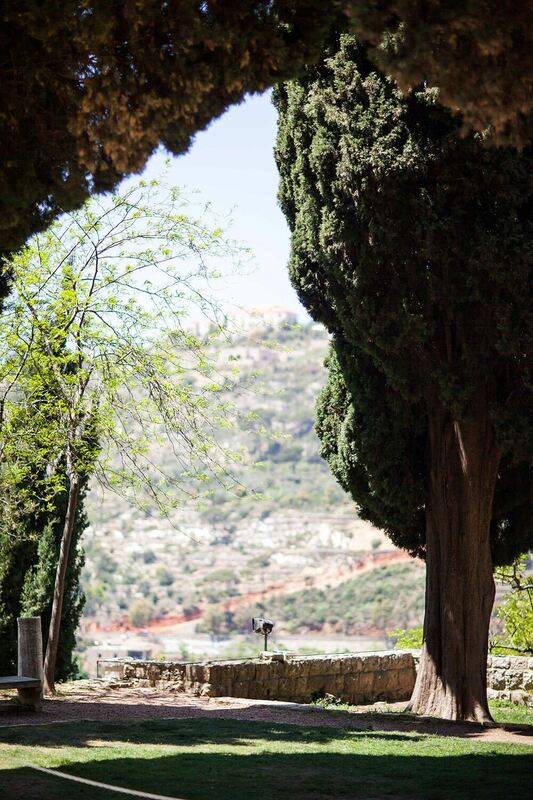 After you’re done exploring every nook of the palace, head down to the gardens to enjoy a fresh breeze of air and stunning mosaic and gorgeous views of the nearby villages . This place is so extraordinary! I would love to visit and I adore your casual chic look. Such elegance and class Tamara! Thank you Kathrine! I hope you get the chance to visit it one day. For sure this place would take my breath away – will have to add this to my list! It’s stunning, and so are you! Thank you Kim, have a great May! Oh wow…the place is absolutely amazing! What an amazing architecture! It’s even more amazing in person. Thank you for stopping by Lola! The history & architecture is one of my favorite things to see in other countries! Thanks so much for showing us this! This looks like such a gorgeous location! Amazing photos, and I love yout outfit! These photos are just beautiful! Looks like an amazing time. I love your outfit, too! These photos are SO beautiful! Love your outfit! I need that striped top! That place is gorgeous! I must have to check it out! Amazing piece of art! Love you cozy outfit! Wow, just wow. Such lovely photos and you look stunning!! Love that skirt and top. The place looks beautiful, love your outfit! Some stunning images here and the colours are gorgeous. Your outfit is so simple yet elegant – love it! SO beautiful!!! This is definitely on my list for places to visit! The palace is stunning. It looks like an amazing experience to visit a place like that. Beautiful photos! What gorgeous photos of this breathtakingly beautiful palace, WOW! I love the fact that it’s open to the public as a museum and that the president stays there seasonally, I’ve never heard of such a notable and historic place being open for people to enter and explore the same place a president stays, even if he’s not there at the time of the openings, cool! The architecture is absolutely gorgeous. I’ve told you this before, but I truly wish to visit Lebanon someday. My mom has quite a few friends and I just adore the food and overall culture, so beautiful! Thanks for sharing, beauty, and I hope you’re having a great start to your week so far! PS: I adore that skirt! 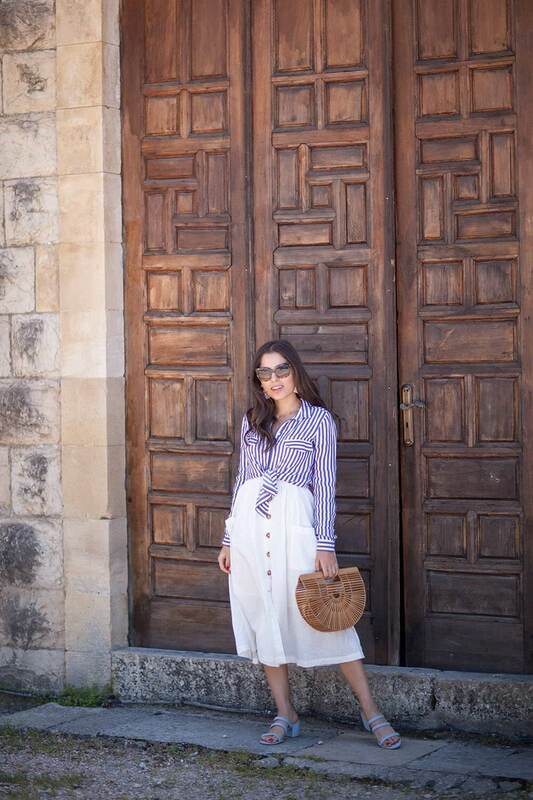 This place is so beautiful and I’m totally in love with your outfit – you are rocking it girl! This is the most perfect outfit for the setting. I love the stripes and that super cute bag! You are so gorgeous!! I just love this blue and white look! I cannot believe those mules are from Foever21! Great find. This palace is amazing. Love the photos! I’ve always wanted to visit Lebanon, and your pictures are proof as to why I need to! 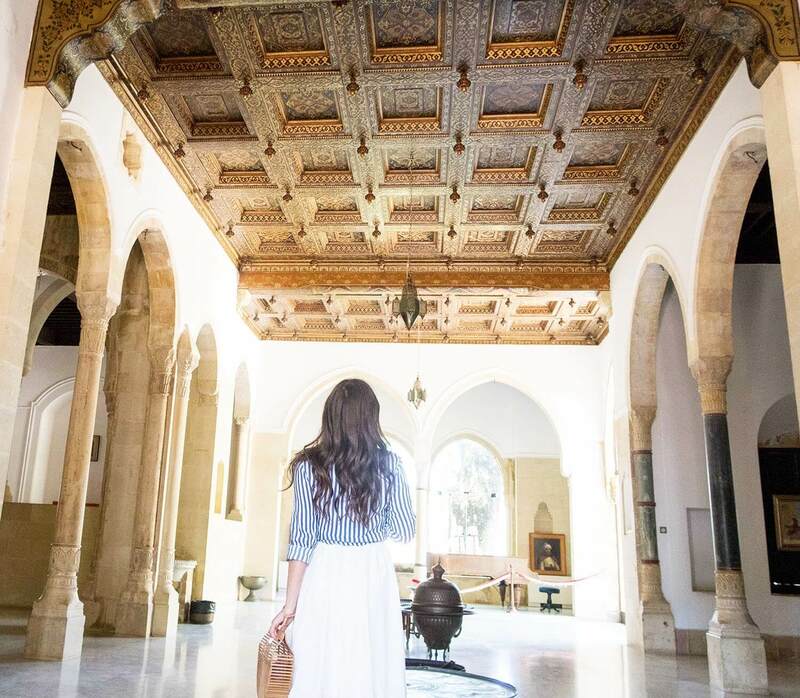 Beit El Dine Palace looks absolutely breathtaking, and you look beautiful too! Whoa, what a beautiful place! It’s really ornate, just look at all the details! By the way, I love your style, very simple and classic! wow this place is so gorgeous!! It looks like a movie scene! SO beautiful!! Gorgeous photos! Love this look too! I love the outfit and the place! So Stunning! Oh wow this is so beautiful! I wanna go there one day! I won’t lie, Lebanon isn’t somewhere that has really been on my travel to-do list, I want to visit as many places as I can through the years so I’m sure it would have popped up eventually, but after reading this post it might have to be bumped up the list. It looks beautiful! This place is amazing Tamara, more pictures please! Love your outfit, stylish and yet it looks so comfortable. Seriously how stunning is this place? Wow this looks beautiful! Love your outfit! That bag is definitely the “it” bag of the season! Incredible place and look. Love this girlie and pretty style. The shirt is my absolute favorite! The place looks magical, and your outfit is the perfect combination of modest and fasionable. I love the 50s vibe. Your outfit is so gorgeous! I love the white and stripes together! These photos are absolutely gorgeous babe! 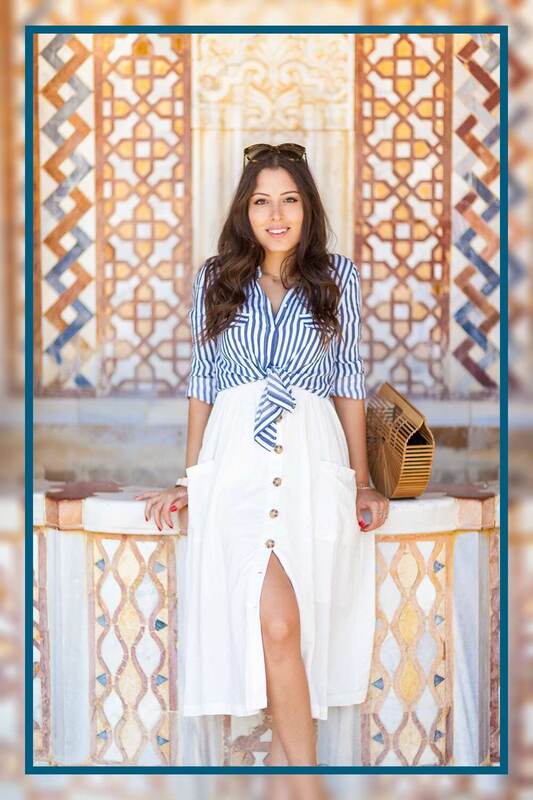 The white skirt and striped top make the PERFECT trendy vacation look 🙂 Thanks so much for sharing girl! Precioso lugar y un look genial. Estas guapísima. These are absolutely beautiful pictures! What a beautiful skirt! And this location is stunning!